Formation of legal documents is the integral part to practice law and possessing good drafting skills is crucial for every lawyer. 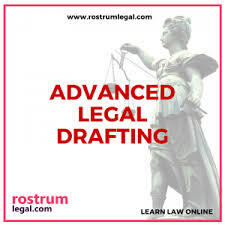 This course on advanced legal drafting is precisely developed to teach you to draft various types of legal documents. Drafting of each document is taught along with related practical and theoretical aspects. The course follows a unique ‘practice and learn’ method in which you will be actually involved in preparing legal drafts by following the step by step guides provided for each type of document. This is a self-paced course, learners are free to study the course module and take the tests at their own time and convenience. Registrations Open for 1st Batch of April 2018 are open. Click here to register. Practical Course on Legal Drafting. Course Content designed and prepared by R&D Team at RostrumLegal. More than 25 types of Drafts for future applications. Application-based assignments on legal issues. Online Course, which can be, accessed 24*7 at your own convenience. Learn from anywhere/any electronic device. Self Paced Course Completion Test. Unique Certificate ID for verification at any stage. RostrumLegal has limited seats for the course and hence you may apply at the earliest to ascertain your seat.